Postsecondary education is a singular factor in determining the lifetime earning potential of the average American. The difference in potential earnings is staggering, making it a critical variable in combatting multidimensional poverty. Estimating not only educational attainment, but also employment success is crucial in understanding the impact of a successful K-12 educational system. 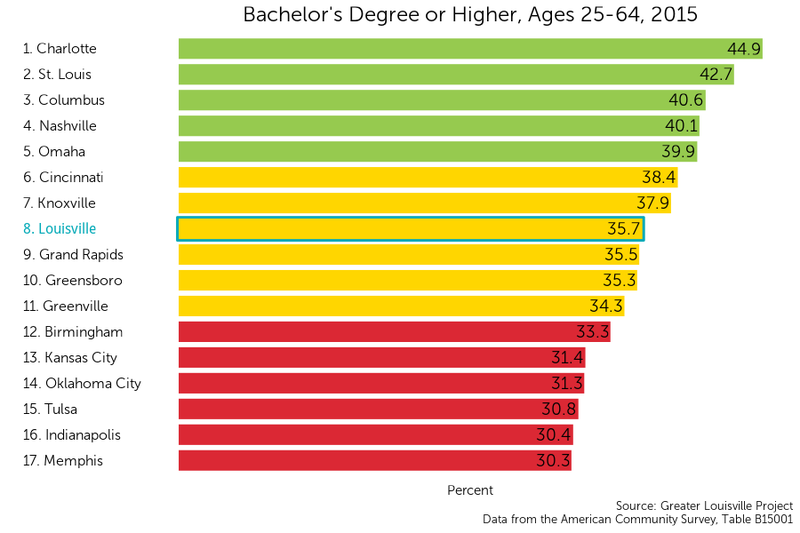 The metric for postsecondary education is percent of working age adults with a bachelor’s degree. Louisville has a target goal of 40% of working age adults obtaining a bachelor’s degree or higher. Louisville currently ranks 8th among its peer cities in rates of individuals who have earned a bachelor’s degree or higher, with 35.7% having earned at least a bachelor’s degree. Although Louisville lies in the middle cluster, it is very close to meeting the peer city average. Louisville is in the middle of its peer group according to a natural breaks algorithm. Cities in green are those that outperform their peers, cities in yellow represent the middle cluster, and those in red are cities that lag behind their peers on this indicator. Where are bachelor’s degree holders concentrated in Louisville? Although Louisville ranks 8th out of 17 cities in earned bachelor’s degrees or higher, there is a clear geographical divide in the attainment of a secondary education degree. In the map to the left, areas where bachelor’s and advanced degrees are earned at a high rate can be seen in purple, where those who struggle to earn secondary degrees can be seen blue and white. High attainment of a secondary degree can be seen in eastern Louisville, among communities such as Northeast Jefferson and Floyd’s Fork, where the highest percentage reaches 82%. In comparison, western Louisville communities earned fewer secondary education degrees, with the lowest rate being 2% in Portland and Russell neighborhoods. Despite ranking 8th in comparison to peers, Louisville’s attainment rates of bachelor’s degrees or higher have been steadily increasing since 2006. Though Louisville’s trendline average is lower than that of its peers, the city is making strides in the right direction and Louisville continues to increase its secondary education achievement rates at a faster pace than its peers.